In the movie The Informer, honorably discharged Special Ops soldier Pete Koslow’s (Joel Kinnaman) world is turned upside-down when he is jailed after a fight to protect his wife (Ana de Armas). 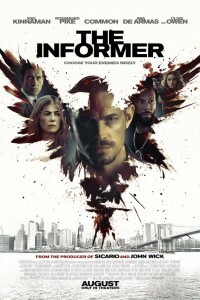 He’s given a chance for early release by becoming an informant for the FBI (Academy Award nominees (Rosamund Pike and Clive Owen) and using his covert skills in an operation to take down The General, the most powerful crime boss in New York. Caught in a world of impossible choices, Koslow must return to prison, where he formulates a plan to escape the clutches of three of New York City’s most powerful organizations – the mob, the NYPD and the FBI – in order to save himself and his family.